Professional musicians structure their practice to make the most of their time. They often have many projects going on at once and have to prepare for various rehearsals and performances at the same time. When they sit down to practice, they know exactly what they need to accomplish, how they will accomplish it, and how long they will need to spend on each task. 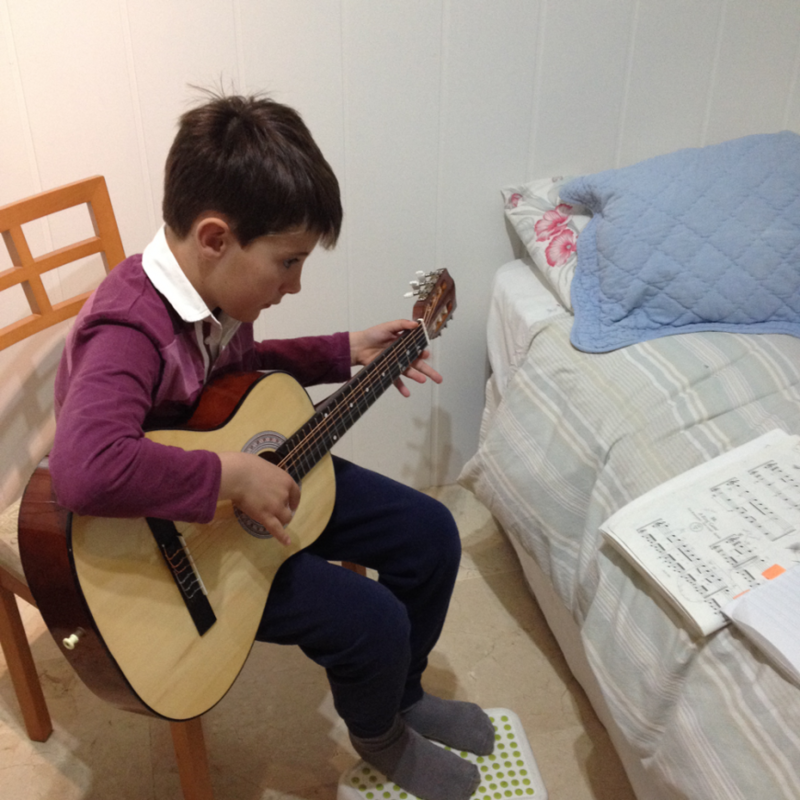 Image above: Victor is an eight-year-old beginner who likes playing melodies and arpeggio pieces in TAB and has learned to read the notes on the first three strings. In contrast, many amateur guitarists “practice” by playing around on the guitar. They start with a section of a new song for a few minutes until they hit a rough patch, then they play an old favorite until they reach a section they have forgotten, then they play a different section of the first song, then their new favorite chord progression, and so on. This kind of random, unfocused play is fun and relaxing, but it is not the best way to make progress on the guitar. Productive practice comes in four categories: technique, new material, repertoire, and musicianship. A balanced practice routine should include attention to each of these areas – not necessarily every day, but at least a few times a week. I will use two current students as examples to illustrate how to adapt professional practice habits to a just-for-fun relationship with the guitar. Hannah is an experienced musician (opera singer and pianist) who is new to guitar. She likes learning classical guitar songs and accompanying herself in folk/singer-songwriter songs, and is dabbling in flamenco. Studies and exercises break down playing into smaller components and allow you to concentrate on one mechanism at a time. When that mechanism comes up in a song, it will be a lot easier to grasp and make clean. You can use your technique as a warm-up routine. Warming up before you play means that your hands will be ready to go when you get to the real music. You'll sound better and feel more comfortable. Technique helps you maintain all or most of the mechanisms you need, regardless of what you are using in your current repertoire and new material. Change up your technique routine regularly! There are hundreds of excercises out there for any given technique you could want to improve (scales, ligados, arpeggios, etc.). Stick with one warm-up routine for a few months until you have seen noticeable improvement. Then find fresh ways to keep improving the same or similar techniques. Examples of short warm-up routines for two different playing levels. Doing a bit of homework before you start playing a new song will make the learning process smoother and more satisfying. Start with structure. Divide the piece into sections and identify repeated sections. Figure out how the piece works, or how each section of the song works if the sections function differently. For example, some pieces feature melody harmonized with other voices. Some pieces are a melody accompanied by a bass line, chords, or arpeggios. Identify familiar chord shapes. If you have been playing the guitar a while and know your basic chord shapes (G, C, A, D, E and their minor versions), you will find them in all types of music, in various positions and variations. It's easier to learn a shape if you think about it as a variation of a chord you already know, rather than approaching it as something completely new. Finger the piece before you start. With your teacher's guidance, write in fingerings for the left and right hands. Having logical fingerings from the beginning will make your life a whole lot easier. Here are two examples of beginner guitar pieces prepared for a student like Victor to start learning. Remember that it's always easier to learn music right the first time than to re-learn. Our hands remember motions and shapes whether they are correct or not. Jumping into a new piece without preparing almost guarantees that you will have to go back and correct your muscle memory later. Once you have started playing a piece, you will find that some sections come easily while others pose challenges. Identify the difficult parts and spend the majority of your time on those sections. A more advanced example of a new song, analyzed and ready for Hannah to begin playing. Writing in right-hand fingerings is really important for beginner-intermediate guitar pieces like this! Repertoire is music that you have learned and memorized and that you want to keep playing. If you want to remember a piece, you need to play it two or three times a week. Set aside time to maintain challenging parts, and experiment with different interpretations to keep it fresh. Examples of repertoire for students of different playing levels. Repertoire is also music that is ready to share when the opportunity arises. Sharing your music is fun and a great confidence boost. If you only have songs that are new and in pieces, you won't feel comfortable playing for listeners. So make sure you always have a few pieces ready to show off and to play for yourself when the mood strikes. Improving certain skills will deepen your understanding of music and help you learn new songs faster. Active Listening: This means giving a song your undivided attention and making sense of it solely by listening. This is a must for musicians of all styles and levels! Listen to any song and try to define the structure in just one listen. Pick out important moments in the song like key changes, tempo changes, and builds in intensity. Identify familiar techniques and think about how the musician is achieving a sound. Is he playing an arpeggio while bringing out a melody on the first string? Is he muting the guitar for a special rhythmic effect or using special techniques like pizzicatto or harmonics? Is he changing the tone of the guitar by moving closer to the bridge? Reading Notation: If you are a classical guitarist, improving your reading skills will help you learn music much faster. A fun way to improve sightreading is to chose a new piece at an appropriate level, give yourself five minutes to study it, and then play it the best you can, beginning to end. The point is not that you play every note perfectly, but that you understand how the piece works, hold it together regardless of errors, and stay in rhythm. Music Theory: Not every amateur guitarist is interested in theory, but understanding some fundamentals will help demystify the guitar. Ask your teacher to guide you towards books and other resources on the subject. Ear Training: Try picking out a melody by ear. Listen to a very small section (5 seconds or less) and sing what you want to play before you look for it on the guitar. Also, try one of the many apps that are out there for ear training! After each lesson, organize your material into each of these categories and define specific goals that you want to achieve. The smaller and more precise you make the goals, the better. If you break down your practicing into small tasks that can be completed in 10 minutes or less, the tasks will seem more approachable and you will be able to use small chunks of free time more effectively. After a successful focused practice session in any area, you should be able to articulate exactly what you accomplished. For example, maybe now you can smoothly change positions in a two-octave scale, play a section of a new piece a bit faster, or play a song from your repertoire with fresh dynamics and tone color changes. Or if you concentrated on musicianship, maybe you deciphered the structure of a song solely by listening or made it through a new level of an ear training program. Keep Playing Just For Fun! Structured, disciplined practice will help you get a lot more satisfaction from the guitar. That doesn't mean it should take the place of playing around and doing whatever you feel like in the moment. Plan your structured practice to be in addition to, rather than instead of, your free play. You'll notice that the more you improve, the more fun you will have playing around, too!